The start, in overcast conditions, was troublefree, unlike Saturday’s race, but poleman Soheil Ayari lost two places at the first chicane. 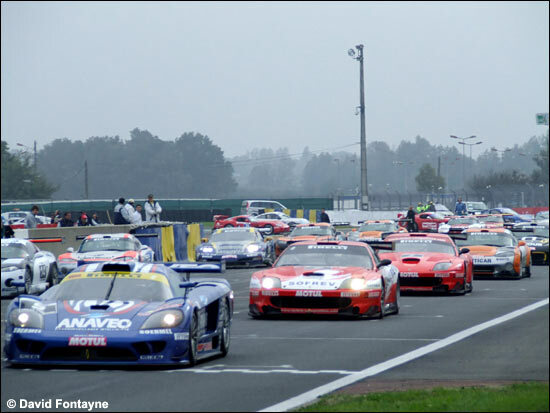 Makowiecki (#10 Mirabeau Viper) got ahead of Policand (#2 Larbre Ferrari 550) and Ayari (#9 ANAVEO Oreca Saleen). 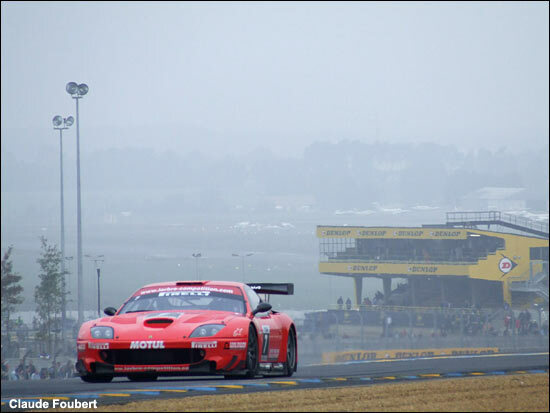 Dumez (#24 PSI Corvette) was in fourth place ahead of Gardel (#7 Larbre Ferrari 550 – the restrictorless car). The three leaders widened a gap over their challengers. Behind the first five cars, a bunch of Vipers was fighting hard: Laserre (#14 Tarrès Team), Thévenin (#1 VBM), Zangarelli (#12 CD Sport) and Giroix (#4 First Racing). Palttala (#25 PSI C6.R) and Cayrolle (#26 SRT C5-R) were charging after the Vipers. Soheil Ayari was pushing and was soon in Policand's mirrors. Makowiecki took advantage of this battle to escape for a while, while Dumez was now very close to the leaders, as was the field, because there were only thirteen seconds between the first eleven cars. Ayari attacked carefully and succeeded in passing Policand at the Garage Vert after 20 minutes. However the front cover of the Saleen began to break loose. He chose to pit to change the cover and to be replaced by Bruno Hernandez. The other (quick) drivers decided to stay longer on the track. Maowiecki had a small gap on Policand and Dumez, Gabiele Gardel being in fourth place a bit further back. 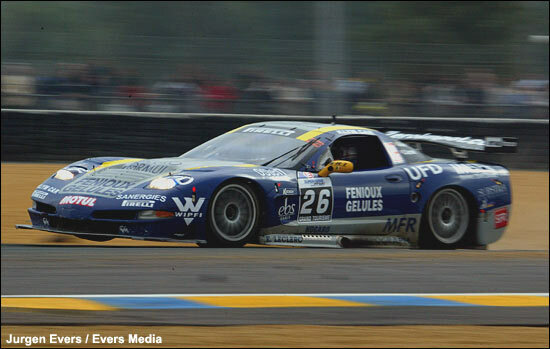 After all the driver changes, Blanchemain (#24 PSI Corvette) was in the lead, ahead of Balthazard (#2 Larbre Ferrari 550), Police (#10 Mirabeau Viper) and Hernandez (#9 Oreca Saleen) who had passed Kuismanen (#25 PSI C6.R). Hernandez was a flyer and passed Police first, then Balthazard. 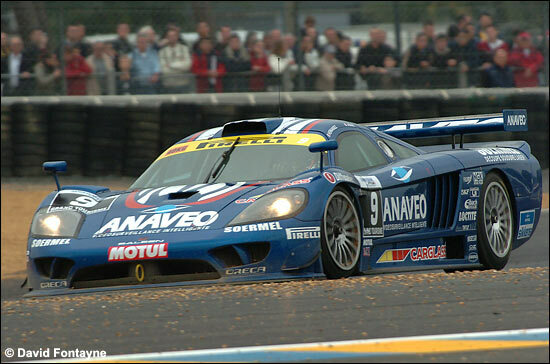 Finally, within eleven minutes of the chequered flag, he overtook Blanchemain, the Saleen taking its seventh 2007 win. Kuismanen succeeded in taking a very good second, with Blanchemain third in the other PSI Corvette. Balthazard, Dupard (#7 Larbre Ferrari), Bornhauser (#1 VBM Viper), Police and Debard (#14 Tarrès Viper) were fighting and in the late stages: Bornhauser was the winner of this fight ahead of Balthazard. Kenis and Cayrolle finished ninth in this one, in one of the SRT Corvettes, after their second on Saturday. This is one of the photographs of the season (by David Fontayne): Ayari shouts with joy, Hernandez crossing the line in front of him. 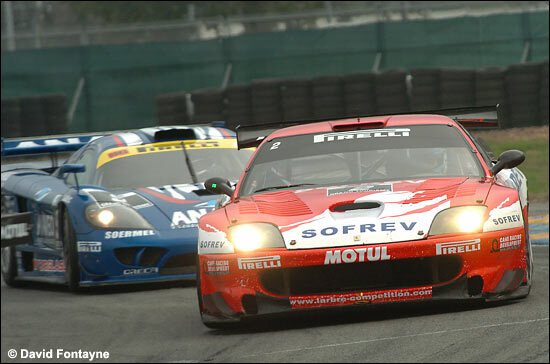 In the GT2 Trophy, Eric Hélary (#44 Ruffier RACING Dodge Viper GT3) was in the lead during his stint, ahead of Monteiro's #37 Estoril Porsche and Michel Lecourt (#36 IMSA Porsche), but after the driver changes, Narac (IMSA Porsche) eventually took the win ahead of the Monteiro brothers and Hélary / Medici. So a title for the seven-time winners, and this coming weekend, the FFSA GT cars will have a handful of British GT cars among them, led no doubt by the ‘French’ Panoz of Tomlinson and Dean. Bruno Hernandez: “Title or not, I wanted this win. I didn't want to be champion when finishing behind the others. During the season, I had much pressure, I have been asked to be careful, and there I went for it. I wanted to prove to everyone that I could be quick and win some races while taking some risks. We are very pleased with the work of Oreca. At the start of the season, the Saleen wasn't so reliable and so quick. I believe that the work of Oreca in the Le Mans Series has been fruitful. Now, my aim is to be within a second of Soheil's lap times. There's still some work to do... "
Pertti Kuismanen: “Our second place isn't enough, but as we started from the eleventh position on the grid, it is not so bad. Markus was delayed in the traffic for several laps, and then he could move up to sixth place. So, I pushed hard as much as I could. In the late stages, I was on the fuel reserve, the engine was hicupping and I was worried by Jean-Luc Blanchemain's comeback. Soheil Ayari and Bruno Hernandez did a great job, we did our best, but the Championship was settled at Val de Vienne. I believe that we will be here again next year to play for the title." Sébastien Dumez: “The Corvette is efficient and doesn't wear the tyres too much. With a full tank, it was a bit difficult, but afterwards the car stayed consistent and fast, so I could catch the leaders at the end of my stint. The car is efficient, it is a good try. We were aiming for a podium, and we've done it." Raymond Narac: “We weren't very quick, because we had a problem with the rear bumper, and the car was hard to drive. However, we had a good strategy. 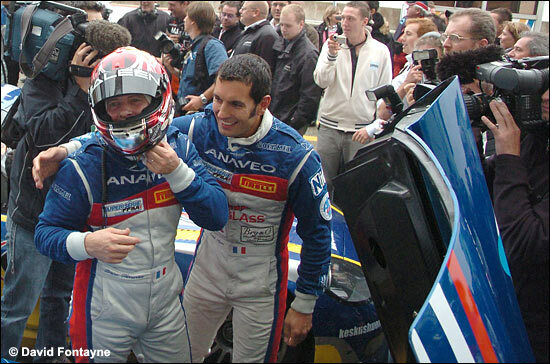 Magny-Cours will be my last GT2 race, for I should be in the GT1 category next year." Philippe Tillie ( PSI Expérience Team Manager / Owner): “I am very pleased with my line-ups this weekend. Second and third today, it is fine. Our misfortune during the qualifying session cost us the win, maybe. We had contenders who were too strong for us and we made some mistakes, as at Dijon and Val de Vienne. We haven't decided anything yet for next year, everything is open. We have several options that we are considering. If my entry is accepted, I would like PSI Experience to race in the 24 Hours at least once."